San Diego Comic Con has been the place for the major publishers to release information on both their upcoming films and also their comic plans for the year. Last year DC shocked the world with the success of Rebirth and the company looks to continue that momentum into the next year with continuations of Rebirth and Metal. Here are some highlights from what I'm excited about for DC. A lot interesting news came out of the DC Publishers Panel with Jim Lee and Dan Didio. Jim Lee has touched on a few big things. First the deal with Milestone comic does seem to be going forward. The Milestone stories will take place on the alternative universe of Earth-M (M being for Milestone). It is moving forward with the collaboration of Reginald Hudlin. DC Super Hero Girls will continue to be focus to draw in girls 6 -13. There will also be a line called DC Young Readers that will focus on young children. An Evergreen line is being launched to focus on new creative stories for mature audiences like Sandman. DC is also considering launching an online service similar to Marvel Unlimited. Both Lee and Didio are very excited about the Metal Cross Over and Dark Matter in which the Immortal Men created by Lee will be playing a major role. Grant Morrison revealed that he is working on an Arkham Asylum sequel in Arkham Ayslum 2. “A DREAM OF ME” part 1! Following his marriage proposal to Catwoman, Batman leaves Gotham City on a quest of renewal and redemption. As he travels and fights, he encounters members of his family—each disturbed by Batman’s journey, each ready to stand in his way, each ready to push back against Batman’s stubborn determination to evolve into something better than a superhero. First DC has the Justice League film coming out in Nov 2017. The success of Wonder Woman gave the DCU new life. I expect to see a lot of focus on the Justice League that could solidify the footing of Film Universe. There is also some mystery on what is coming next for the DCU which could explained at SDCC. Warner Brothers has a slot for a film in July 18 that has long thought to be DC related. However, neither the Flash film or the Batman film have seemed ready to come out at that time. The Flash film has ran into directorial problems which I'm not sure why. The Flash TV show has hit some bumps but is still quality entertainment and making the Flash bigger than he has ever been. If nothing comes out in July of 18 then the next film in the DCU seems to be Aquaman in Dec of 2018 which seems a bit crazy. A whole other SDCC will come and go before we see that film. That said I am really excited for that film. I think Mamoa has energized Aquaman and that is showing up in print form as well. Alright last year was big for DC but I think the next year may in fact be bigger. The Rebirth Mysteries of who is behind Rebirth will continue, the mystery of who is Oz the man manipulating Superman will come out and then there is Metal. Before we get into all of that though lets talk about......Aquaman. Freaking the new Aquaman is amazing right now. Seriousily, I have not liked Aquaman this much since I was 4. Dan Abnett the guy that basically created the Guardians of the Galaxy team (MCU version) is at the helm of Aquaman. He is weaving a very intiguing story and the the art, the art is just amaze balls. Penciler Stjepan Sejic’ is a rock star! This is the first comic I read right now after going to the comic store. The focus on Aquaman may in part to build some hype ahead of the film in 2018. It seems a little early for that. I think what really has happened is that DC just struck gold on this creative team. Its just another sign though of DC pulling in top level talent and turning out high quality books. The other major part of DC's game plan is Metal. I have read the prelude to Metal in the Forge and was blown away. This is another comic story that has been in the works for years and has been building up, with evidence sprinkled about. This is a big event created by Scott Snyder the Batman dude and seems to be extremely well thought out and different. 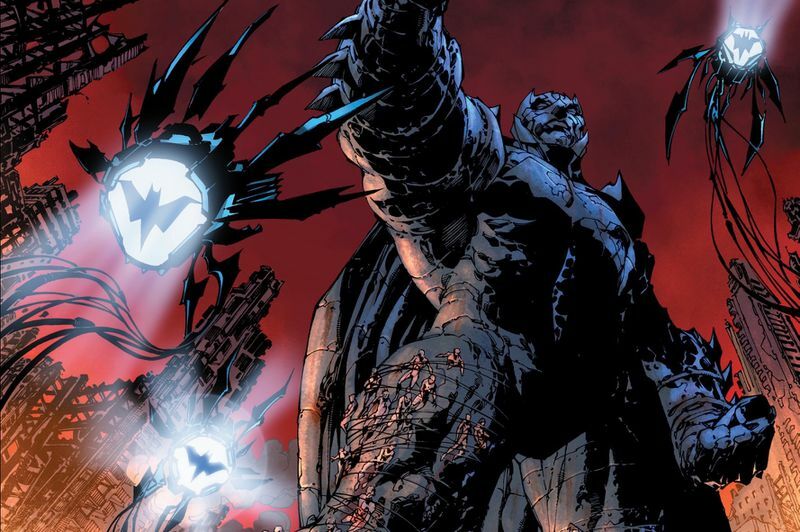 Metal involves Batman researching a mysterious metal that seems to hint at a supernatural element existing in the world that does not quite make sense. This metal ties to the origins of many superheroes and supervillains. Meanwhile a dystopian DC dimension threatens to merge its way into the main universe. What does this universe have to do with the metal? The other big thing that I expect to hear about at SDCC is Doomsday Clock. Doomsday Clock will be another series that delves deeper into the underlying mystery of Rebirth. This in effect is a continuation of the Button but will star Super Man instead of Batman/Flash. This series is exciting because it promises to reveal more of the mystery and perhaps will have Super Man meeting/confronting Doctor Manhattan. Of course in DC when the word Doomsday shows up everyone knows to expect the big bad gray guy as well! 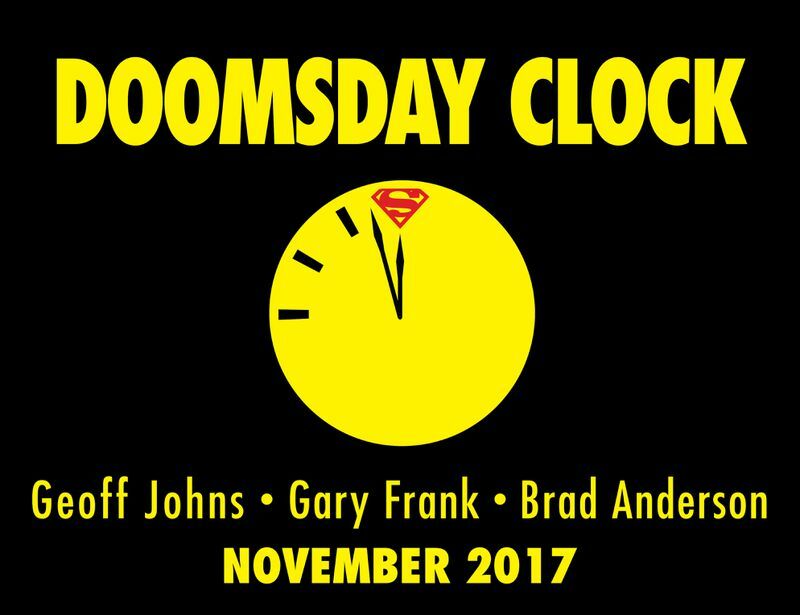 Effectively the Doomsday Clock is a amagalmation of Watchmen's Doomsday Clock Theme and the character of Doomsday. Geoff Johns who has helmed the Rebirth reboot very well so far is in charge of the series. I really don't know what to say other than DC's Print Future looks exciting. I will bring updates as they come in through out the con on this post. Stay Tuned!